The film Moneyball is based on the real-life story of the Oakland A's, one of the least winningest teams in baseball before they started applying "moneyball" theories to make up their roster. 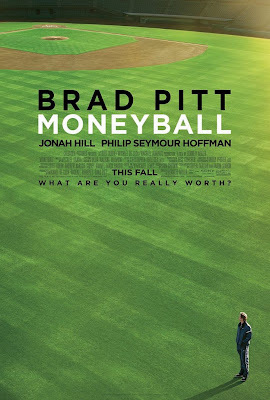 From what I can tell, a lot of the story has been changed or altered for the movie, but the story presented in the film is a captivating one, especially with Brad Pitt playing the lead character, Billy Beane. Billy Beane (Brad Pitt, "The Tree of Life"), the general manager of the Oakland A's, has just lost three of his best players, and he's looking to recruit some new ones. On a trip to the Cleveland Indians office, he meets Peter Brand (Jonah Hill, "Get Him to the Greek"), a Yale whiz kid who is great with statistics. Instead of buying an Indians player, he buys Peter, and together they start to put together a team based on statistics rather than actual playing ability, or at least what they have seen in footage of the players. The manager (coach) of the team, Art Howe (Philip Seymour Hoffman, soon to star in "The Ides of March"), doesn't agree with Billy's ideas, and he tries to play the best players only; however, Billy has ways of getting around this. The story in Moneyball is definitely interesting; my only complaint is that the movie is about 2 hours and 10 minutes long, and it tended to move very slowly. We learn the back story of Billy Beane (who is still the general manager of the Oakland A's, by the way), how he was recruited right out of high school to play for the Mets, and how his career ultimately failed and he became a recruiter. He is divorced but has a 12-year-old daughter with his ex-wife (Robin Wright, "The Conspirator"), and for some reason he still wears his wedding ring. I found Beane's story to be even more interesting than the "A-story," that of the Oakland A's, actually. Brad Pitt and Jonah Hill are great here, but Philip Seymour Hoffman is greatly underused; in addition, Chris Pratt ("Take Me Home Tonight") plays one of the new A's players that Pitt's character recruits. Maybe see this film. If you can stand the slow pace, then you will be rewarded with an interesting story, but for parts of the movie I was literally just waiting for something - anything - to happen. This will likely be a showcase movie for Pitt, and most critics will like it - at the time of this review, it has 90% on Rotten Tomatoes - and I don't regret seeing it. However, I am not sure I could sit through its slow pace a second time, if I was so inclined. Moneyball is in theaters today, September 23rd, and is rated PG-13 with a runtime of approximately 134 minutes.